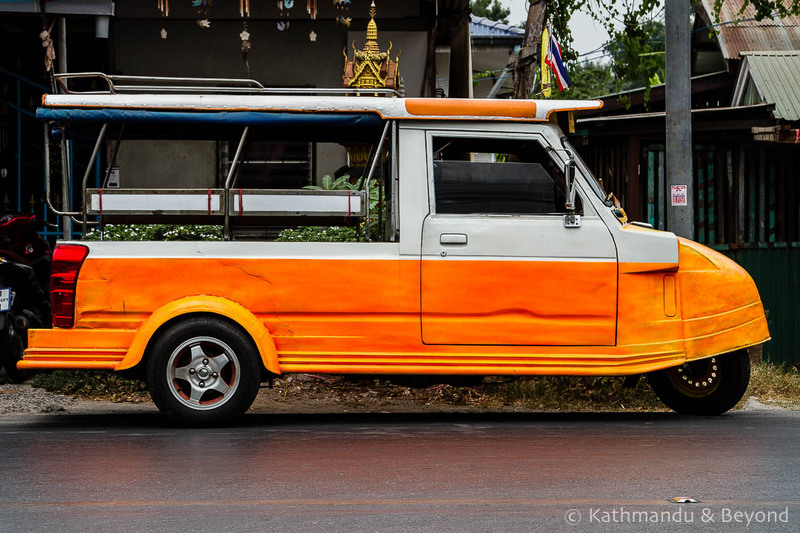 I couldn’t help but go crazy with the camera during our recent visit to Ayutthaya in Central Thailand. 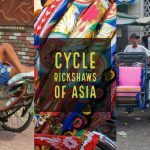 You’re probably thinking the glorious, UNESCO recognised, temples and palaces that should be on everyone’s must-see list when visiting Thailand right? 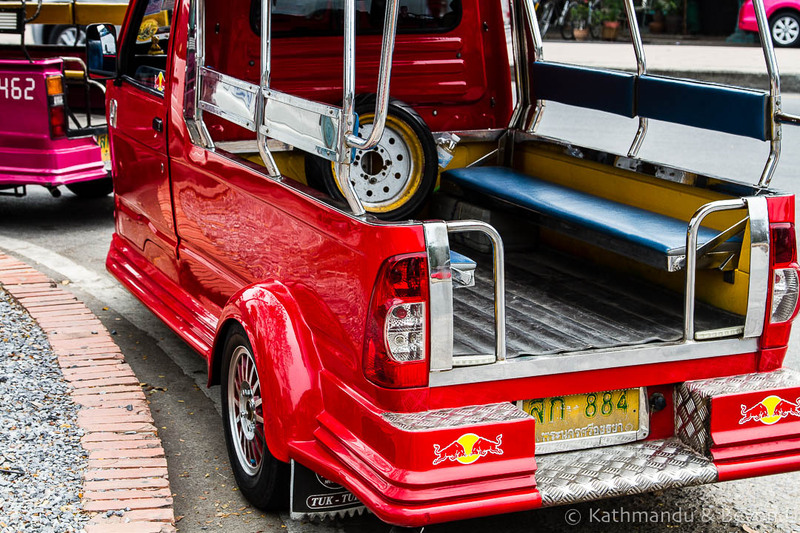 Well, sort of – we did spend a day cycling from one ancient site to the next and indeed have a reasonable amount of photographic evidence to prove that we did so but there was something else that captured my imagination in this former capital of Siam and that was its funny looking motorised 3-wheelers which are universally known as tuk-tuks throughout Thailand. 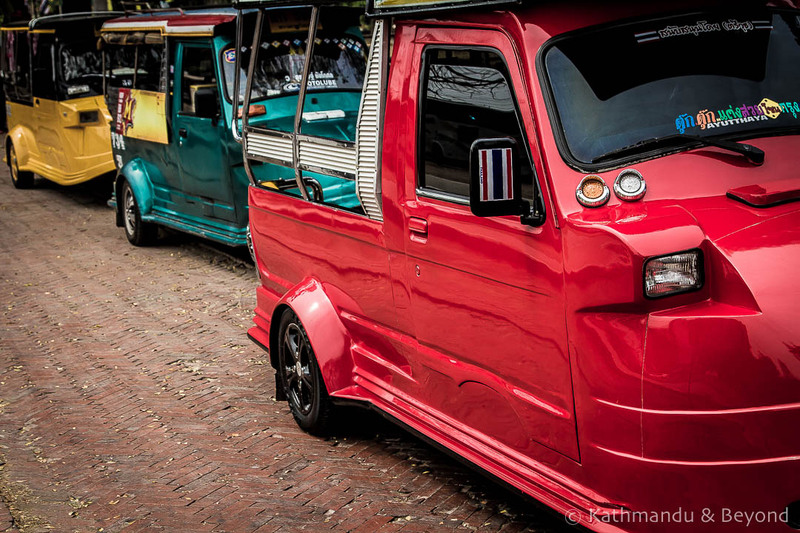 These Darth Vadars on wheels are completely different to the classic Thai tuk-tuk which you see almost everywhere else in the country. 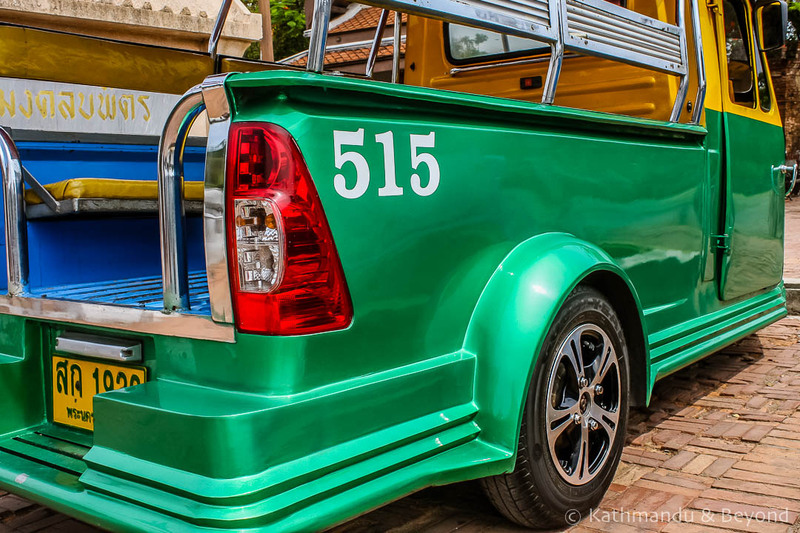 Furthermore, the Ayutthaya tuk-tuk is larger than the classic one and can fit six Westerners (or ten Thais) on the two benches that face each other behind the driver’s cabin. 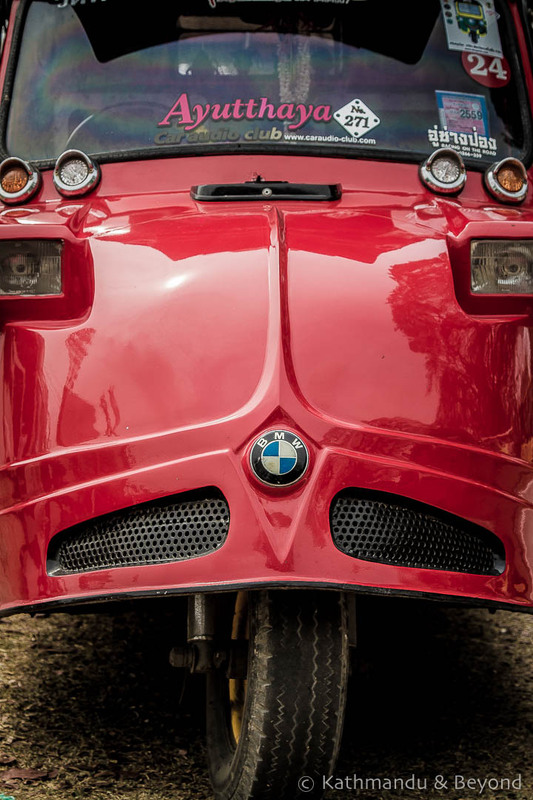 ‘They may have first been made in Japan, which could explain the samurai-like curved front’. 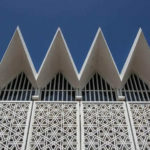 Excerpt From: Lonely Planet. 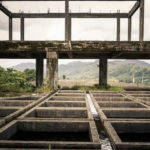 “Lonely Planet Thailand (Travel Guide).” iBooks. 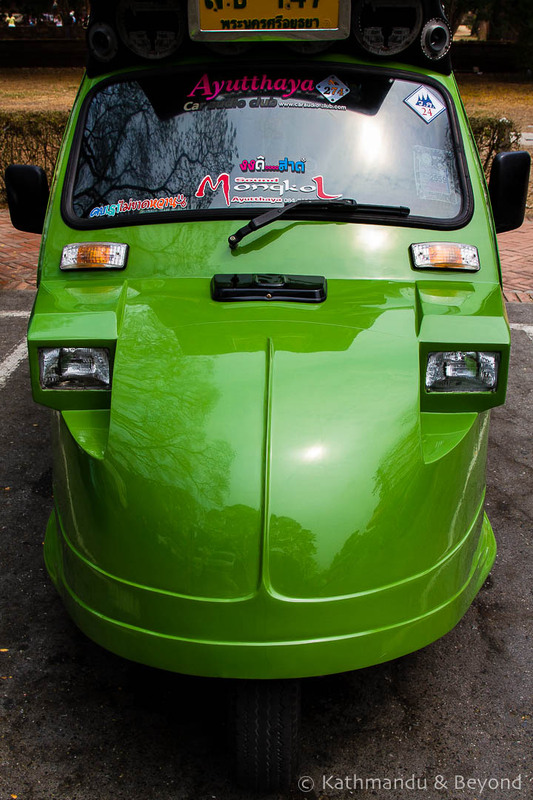 Whatever the story behind their existence, there is no denying that the modern day Ayutthaya tuk-tuk is very well looked after by its owner. Having a shop specialising in paint jobs must be very lucrative in Ayutthaya as that seems to be the first thing on the agenda. Then there are the chrome and the alloy wheels to consider and of course the dangly crap which does such a great job of obscuring the driver’s vision. Add a decent sound-system (thankfully not all of them has this) and you’re good to go. 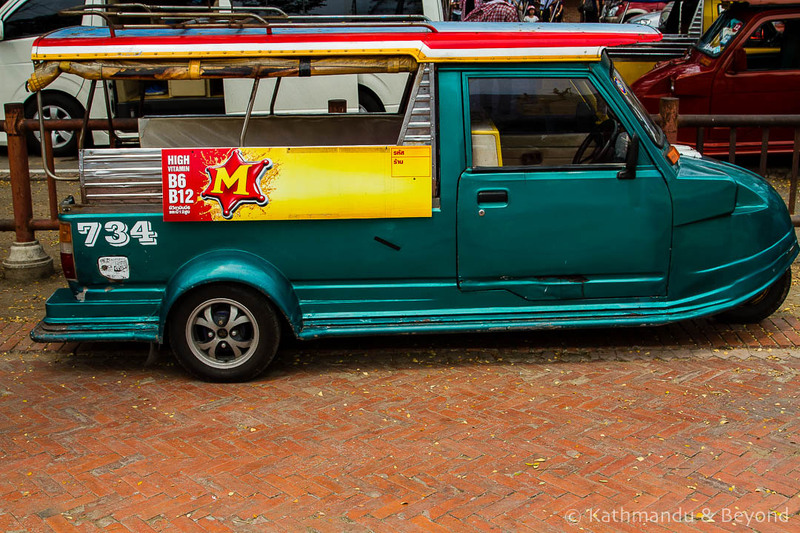 Tuk-tuk drivers score very badly on the rip off front in my opinion but the ones in Ayutthaya weren’t too bad, plus this mode of transport is a good means of visiting the temples. 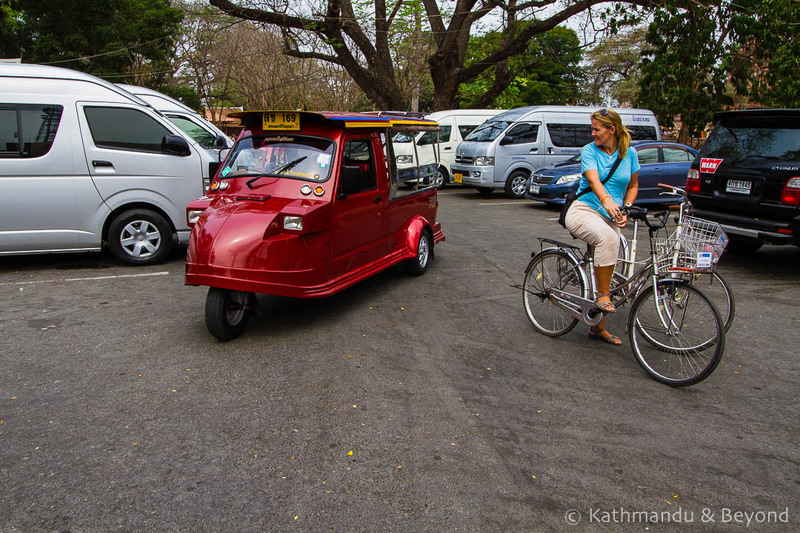 Cycling is OK but the roads linking the places of interest aren’t especially bike-friendly and if there is a small group of you, a tuk-tuk is actually pretty good value. The going rate (April 2016) for hiring one is BHT200 per hour (£4/$6). 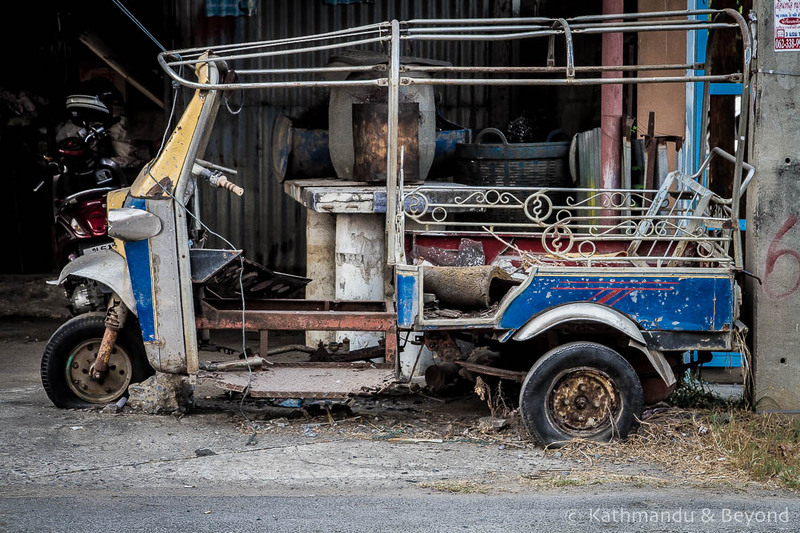 Life in the tuk-tuk world can be so cruel sometimes – rejected and abandoned, a more traditional-style Thai tuk-tuk on the mean streets of Ayutthaya. 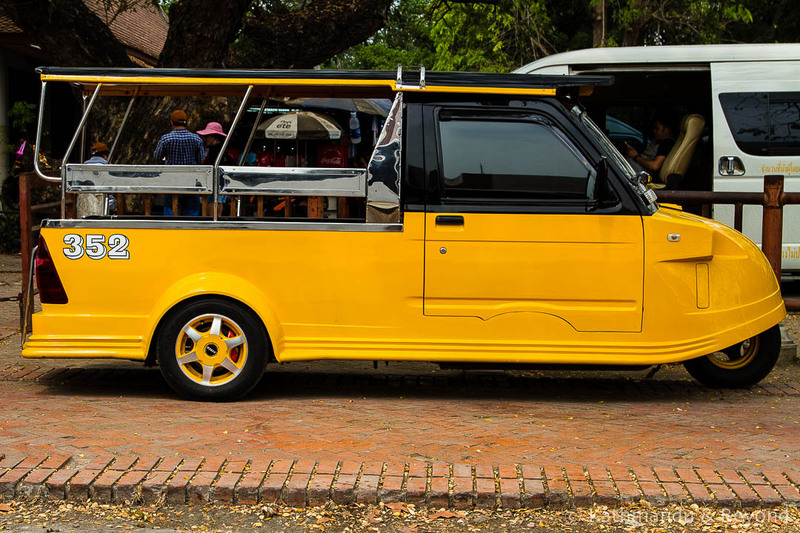 I marvel to think what paroxysms of joy you would experience if someone were to design a tuk tuk in a brutalist concrete style. So many paroxysms (I had to look the word up! ), you wouldn’t believe! I love those, very cool! I don’t remember seeing them in Ayutthaya but that was almost 10 years ago now. The drivers seem to take good care of them, they’re all very shiny. I think there were in the town ten years back but may be in not such an abundance. 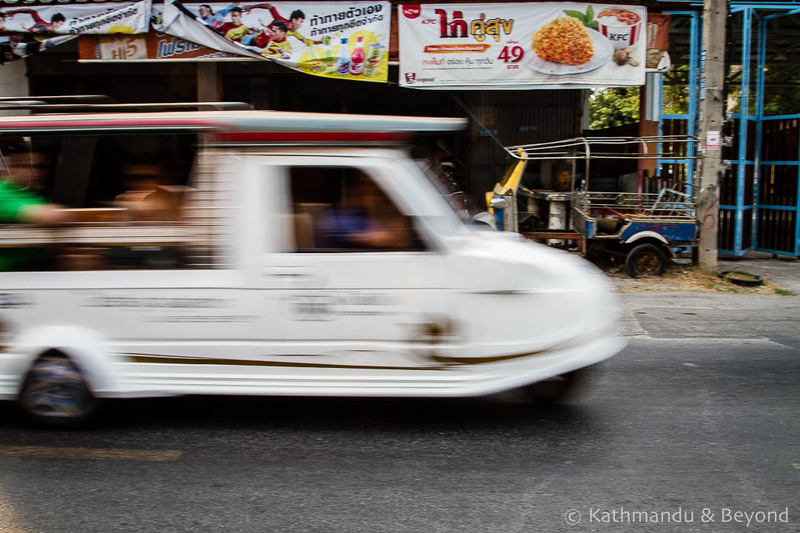 What I like about them is the fact that they can’t go half the speed of the regular Thai tuk-tuk and therefore they simply potter around the town and the ruins – bit like me really! 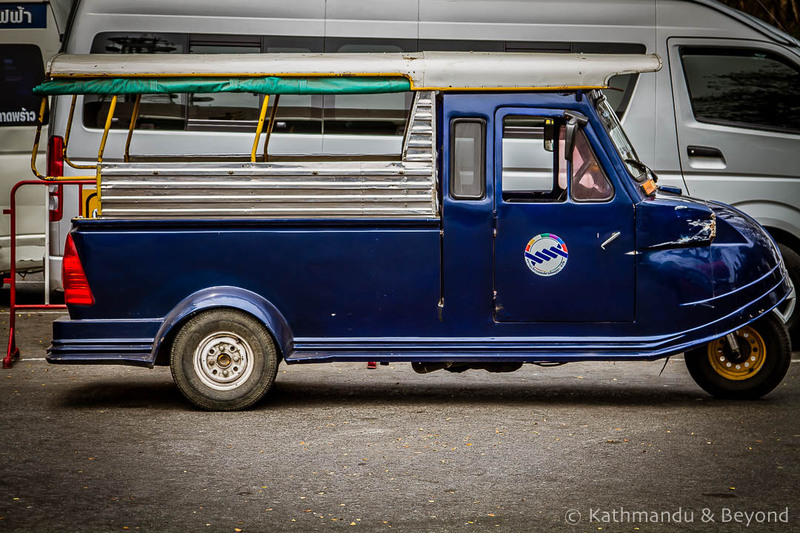 I cannot wait to visit Ayutthaya in November this year and regardless of cost I think we might need to hire on of these, even if it is just for a short journey. 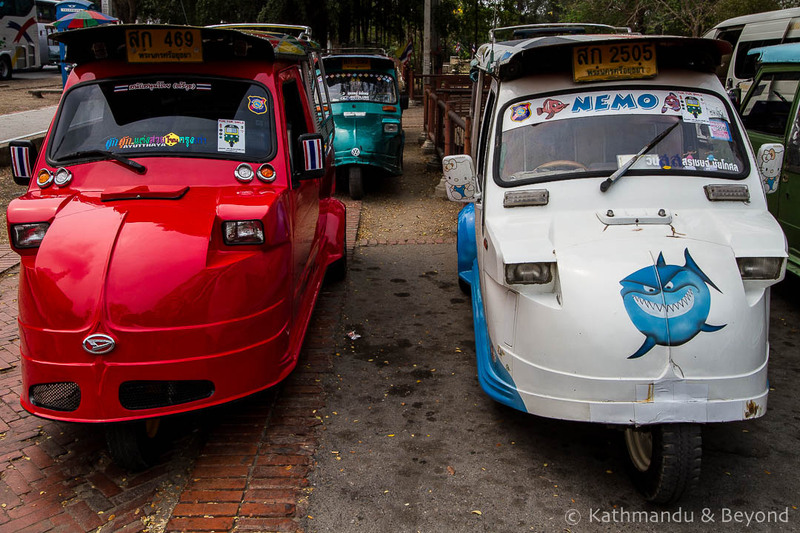 I know tuk-tuks are pricy but I am not sure I will be able to resist these! That’s a good plan. As I mentioned above, cycling around the ruins isn’t particularly pleasant. 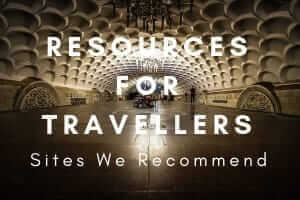 If there is a couple of you or more, it’s a great way to get around. Enjoy the temples and Ayutthaya town if you are overnighting there, which I certainly recommend.